Glaucoma is the leading cause of irreversible blindness worldwide. The global prevalence of glaucoma was 3.5%, and in India, it was reported to range from 2.2% to 5.8%., Medical management is the primary modality of treatment for glaucoma, but in a developing country like India, the recurring cost of medications, their inconsistent availability, especially in rural areas, compliance issues, and lack of understanding about the nature of the disease are significant barriers for the effective medical management. Despite the changing trends in surgical management worldwide with the growing popularity of implants and minimally invasive glaucoma surgery, trabeculectomy still remains the most commonly performed incisional surgery for glaucoma management in India. Both glaucoma and cataract are diseases of the elderly, and the coexistence of glaucoma with cataract has become more frequent because of the increase in life expectancy as well as increased risk of cataract development in glaucoma patients due to medication. These patients require combined cataract and glaucoma surgery for visual rehabilitation, long-term intraocular pressure (IOP) control, and to avoid postoperative IOP spikes, which are deleterious to the optic nerve head. While there are published data on the outcome of trabeculectomy and implants performed by residents,, to the best of our knowledge, there is no report on the outcome of combined cataract extraction and trabeculectomy performed by residents or fellows. Hence, the purpose of this study is to evaluate the outcome of combined cataract extraction and trabeculectomy performed by fellows. Medical records of patients who underwent combined cataract and trabeculectomy surgery performed by fellows between January and December 2015 at a tertiary eye care center in South India were reviewed retrospectively. The study was approved by the institute's ethics committee. Patients diagnosed with primary open-angle glaucoma (POAG), primary angle-closure glaucoma (PACG), and pseudoexfoliation glaucoma (PXFG) were included and those with normal tension, lens-induced, neovascular glaucoma and previous failed glaucoma-filtering surgery were excluded from the study. Both eyes of a patient were included in the study if they met the inclusion criteria. Patients were divided into camp and walk in based on how they accessed the hospital. Camp patients are the ones who reach the hospital via outreach programs and walk in are those who come to the hospital on their own. The glaucoma fellowship program is of 2 years' duration; in the initial period, fellows were made to perform combined cataract extraction and trabeculectomy under the supervision of consultant, and after gaining sufficient proficiency, they were allowed to perform surgeries without assistance. Preoperative data collected were age, gender, best-corrected visual acuity (BCVA), IOP, gonioscopy, optic disc changes, number of antiglaucoma medications (AGMs), and visual field changes. Intraoperative data collected were year of fellowship of the operating surgeon, technique of cataract extraction, and complications related both to cataract extraction and trabeculectomy. Postoperative data noted were BCVA, IOP, number of AGMs, number of sutures lysed, complications, and interventions at each visit. Based on vertical cup-to-disc ratio, optic disc changes were classified as mild (<0.6), moderate (0.6–0.8), and severe (>0.8) damage. Humphrey visual fields were classified as early, moderate, and severe defects according to Hodapp, Parrish, and Anderson classification. All surgeries were performed under peribulbar anesthesia. Superior rectus bridle suture was applied with 4-0 silk. Fornix-based conjunctival incision was made. Mitomycin C (0.2 mg/ml)-soaked Weck-Cel ® sponge was placed under the conjunctiva and Tenon's for 2 minutes and then rinsed with 20 ml of balanced salt solution. A triangular scleral flap of 6 mm × 4 mm was raised up to limbus. Cataract extraction was done either manually (extracapsular cataract extraction [ECCE] or manual small-incision cataract extraction [MSICS]) or by phacoemulsification. After IOL implantation, sclerostomy was performed with Kelly punch and a basal iridectomy was done. The scleral flap was closed with 3, 4, or 5 10-0 nylon sutures and conjunctiva was closed with 8-0 polyglactin suture. Moxifloxacin (0.5 mg/0.1 ml) was injected intracamerally at the end of surgery. Postoperative management included the use of antibiotic and steroid combination in tapering dosage for 6 weeks and cycloplegic twice daily for a month. Laser suture lysis was performed in the postoperative period based on the IOP and at the discretion of the consultant. Surgical success was defined as complete when the IOP was ≥ 6 and ≤21 mmHg without the use of AGM and as qualified if the IOP was ≤21 mmHg with or without the use of AGM. Failure was defined as IOP >21 mmHg on maximum medical therapy (three AGMs), IOP <6 mmHg on two consecutive visits after 3 months, loss of light perception, and additional glaucoma surgery for IOP control. Statistical analysis included mean and standard deviation (SD) for continuous variables. Wilcoxon signed rank test was used to compare the pre- and postoperative IOP and pre- and postoperative usage of AGM. Kaplan–Meier survival curve was used to assess the survival probability. Survival probability was compared between the subtypes of glaucoma, type of surgery, and year of fellowship of the operating surgeon using log-rank test. P < 0.05 was considered statistically significant. Statistical analysis was performed using commercial software (Stata version 13.1; StataCorp, College Station, TX, USA). Two hundred and eighty-five patients underwent combined cataract extraction and trabeculectomy by fellows during the study period. We analyzed 280 patients (282 eyes), as 5 patients did not meet the inclusion criteria. The mean age ± SD of the study population was 67.9 ± 7.9 years, 146 (52%) patients were male and 134 (48%) were female. Mean follow-up was 4.4 ± 4.7 months. Of the 282 eyes, 155 (55%) eyes were diagnosed to have POAG, 87 (31%) eyes with PACG, and 40 (14%) eyes with PXFG. Forty eyes had mild optic disc damage, 101 eyes had moderate damage, and 141 eyes had severe damage. Reliable visual field analysis was available in 98 eyes. The mean deviation was − 14.3 ± 10.6 dB. Ten eyes had early visual field loss, 24 eyes had moderate loss, and 64 eyes had severe loss. Of the 280 patients, 197 were walk-in and 83 were camp patients. Demographic data of the study population are summarized in [Table 1]. Two hundred and fifty-five eyes (90%) underwent MSICS trabeculectomy (MSICST), 9 eyes (3%) underwent ECCE trabeculectomy (ECCET), and 18 eyes (7%) underwent phaco trabeculectomy (PT). There were six fellows (3 each in 1st and 2nd years) undergoing the 2-year fellowship training in glaucoma during the study period. Out of the 282 eyes, 101 eyes (35.8%) were operated by 1st year fellows and 181 eyes (64.2%) by 2nd year fellows. Mean IOP reduced from 21.1 ± 6.7 mmHg preoperatively to 14.2 ± 3.6 mmHg at 6 months and 15.3 ± 4.8 mmHg at 1 year (P< 0.001) postoperatively. Mean number of AGMs reduced from 1.4 ± 0.7 to 0.1 ± 0.1 and 0.1 ± 0.3 at 6 months and 1 year, respectively (P< 0.001). Mean BCVA improved from 6/60 to 6/12 (P< 0.001) at 1 month postoperatively and remained the same till last follow-up visit [Table 2]. Kaplan–Meier survival curve for complete success is shown in [Figure 1]. Complete success was 97% at 6 months and 92% at 1 year and qualified success was 100% at 6 months and 1 year. Three eyes failed during the follow-up period; one eye had loss of light perception and two eyes had persistent hypotony with choroidal detachment. Of the two eyes with persistent hypotony, one eye underwent scleral flap resuturing at 3 months and one eye underwent choroidal drainage at 5 months. Intraoperative complications noted were posterior capsular rupture in 14 eyes, zonular dialysis in 3 eyes, Descemet's membrane detachment in 1 eye, and conjunctival button hole in 2 eyes. Intraocular lens was not implanted in three eyes. Postoperative complications noted were fibrinous reaction in 9 eyes, hypotony in 8 eyes of which 4 eyes had associated choroidal detachment, retained cortex in 3 eyes, hyphema in 2 eyes, conjunctival retraction in 2 eyes, decentered IOL in 1 eye, cystoid macular edema in 1 eye and vitreous in the anterior chamber in 1 eye. Two eyes had posterior capsular opacification which required YAG capsulotomy and 154 (54.6%) eyes underwent argon laser suture lysis. Postoperative interventions are listed in [Table 3]. In patients with coexistent cataract and glaucoma, the outcome of surgery has been reported to be similar for staged and combined procedures., Jampel et al. have reported insufficient evidence in the literature to conclude that staged or combined surgery gives better results in these eyes. Performing combined surgery will help in reducing the financial burden of undergoing two separate surgeries in developing countries. There are reports on the outcome of combined surgery performed by glaucoma consultants,,,, but there is no report in the literature about the outcome of combined surgery performed by fellows. Evaluating this will help us to improve the surgical training in the glaucoma fellowship program which will translate into safe and efficient patient management. In our study, mean IOP decrease was 5.8 mmHg which is similar to the results of Longstaff et al. who have reported 5.8 mmHg decrease in IOP after ECCET. Mittal et al. have reported a decrease of 6.8 and 5.8 mmHg at 1 year in the SICST and PT groups, respectively. Vijaya and David  have reported a decrease of 4.8 mmHg in patients after PT. Mamalis et al. have reported a 7.16 mmHg decrease in IOP after PT. The percentage of complete success was 97% at 6 months and 92% at 1 year, and the percentage of qualified success was 100% at 6 months and 1 year in our study. Vijaya and David  have reported a complete and qualified success rate of 96% and 97%, respectively, after PT at 1 year. Venkatesh et al. have reported a complete success rate of 51.4% in patients after MSICST. Bowman et al. have reported a success rate of 84% in achieving IOP <21 mmHg at 6 months. Thomas et al. have reported a success rate of 90% in the PT group and 88.4% in the MSICST group in achieving IOP <21 mmHg with single medication. 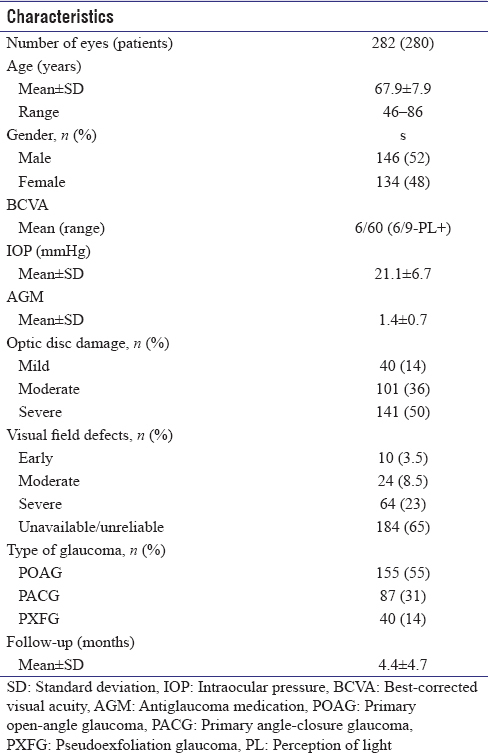 There was no statistical difference in the survival probability among the subtypes of glaucoma (P = 0.51) and type of surgery (P = 0.91) in our study. Visual acuity improved to 6/12 or better in 50% of eyes which is more compared to the outcome reported by Bowman et al. (40% achieving 6/18 or better), but less compared to Thomas et al. (89% achieving 6/12 or better) and Mittal et al. (90.9% achieving 6/12 or better in SICST group). Nearly 50% of eyes in our study had advanced disease at presentation which could be the reason for poor visual outcome. All eyes except four had improvement in visual acuity compared to preoperative vision in our study. Of the four eyes whose vision did not improve, 1 eye had macular wipe out in which the vision dropped from 5/60 to no perception of light, 2 eyes had hypotony with choroidal detachment, and 1 eye had vitreous hemorrhage. Eyes with vitreous hemorrhage resolved with conservative management, but the vision did not improve due to advanced glaucomatous optic neuropathy. In our study, MSICST was the most commonly performed technique by fellows. On an average, each 1st year fellow will perform 34 surgeries and 2nd year fellow will perform 60 surgeries. Survival probability was 95% and 90% for the 1st and 2nd year fellows, respectively, at 1 year (P = 0.64). Twenty eyes (7%) had intraoperative complication, and to our surprise, 2nd year fellows (8.8%) had more intraoperative complications than 1st year fellows (4%). This was probably due to difference in the patient allocation, where 2nd year fellows perform surgeries on difficult and complicated eyes. Fibrin reaction (9 eyes) was the most common postoperative complication in our study and all eyes resolved with intensive topical steroids. Eight eyes had hypotony, in which two eyes required surgical intervention and the rest resolved with conservative management. None of the eyes had aqueous misdirection, bleb-related infection, or endophthalmitis. [Table 4] compares the postoperative complications of our study with others. Intra- and postoperative complications were high in our study compared to that of Mittal et al. and Vijaya and David  probably because in our study surgeons were fellows in their training period, whereas in other studies, surgeries were performed by experienced surgeons. 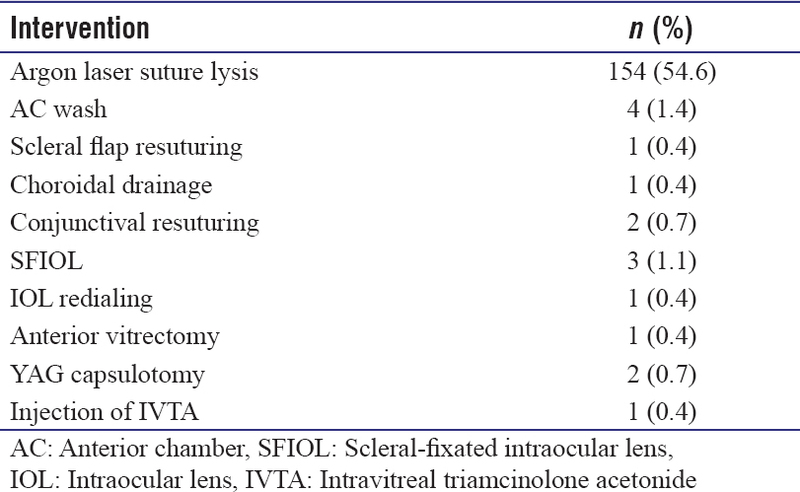 Thirteen eyes (4.6%) had reoperation for complications in our study [Table 3]. Glaucoma being a chronic progressive disease, follow-up is very important to maintain the IOP under control and preserve the existing vision. In our study, 96 (34%) eyes had a follow-up of 6 months and only 57 (20%) eyes had a follow-up of 1 year. Camp patients constitute the major proportion of lost to follow-up; out of the 83 patients, only 6 patients were followed up for 6 months and only 1 patient was followed up till 1 year. Camp patients are the ones who access the hospital via outreach programs; the main difficulty in following up was the financial constraint and logistics in accessing the hospital by themselves. The other reasons for poor follow-up were the lack of understanding about the nature of disease and the belief that surgery will cure the disease. Limitations of our study were its retrospective nature, short follow-up, significant number of patients were lost to follow-up, and visual fields were not evaluated after surgery. Despite these limitations, our study is the first to report the outcome of combined cataract and glaucoma surgery performed by fellows and we believe that our study will help in evaluating the fellowship program. Outcome of combined cataract extraction and trabeculectomy performed by fellows is safe and effective in controlling IOP and visual rehabilitation in patients with coexisting cataract and glaucoma in developing countries. Garudadri C, Senthil S, Khanna RC, Sannapaneni K, Rao HB. Prevalence and risk factors for primary glaucomas in adult urban and rural populations in the Andhra Pradesh eye disease study. Ophthalmology 2010;117:1352-9. Seider MI, Rofagha S, Lin SC, Stamper RL. Resident-performed ex-PRESS Shunt implantation versus trabeculectomy. J Glaucoma 2012;21:469-74. Hsia YC, Lee JH, Cui QN, Stewart JM, Naseri A, Porco T, et al. 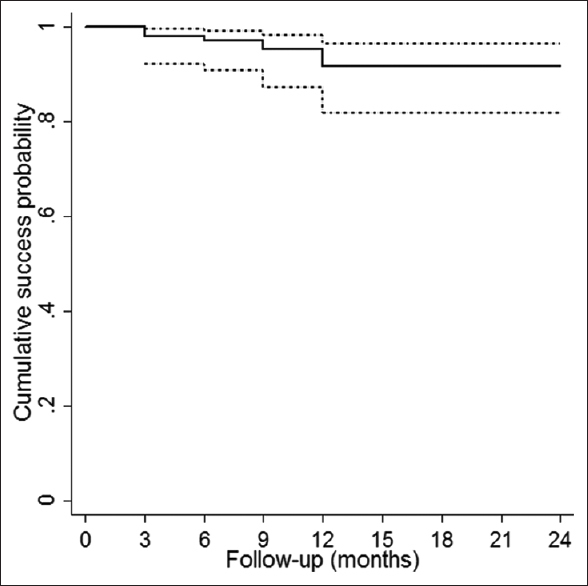 Early reoperation rate, complication, and outcomes in resident-performed glaucoma surgery. J Glaucoma 2017;26:87-92. Hodapp E, Parrish RK 2nd, Anderson DR. Clinical Decisions in Glaucoma. St. Louis: The Mosby Co.; 1993. p. 52-61. Donoso R, Rodríguez A. Combined versus sequential phacotrabeculectomy with intraoperative 5-fluorouracil. J Cataract Refract Surg 2000;26:71-4. El-Sayyad FF, Helal MH, Khalil MM, El-Maghraby MA. Phacotrabeculectomy versus two-stage operation: A matched study. Ophthalmic Surg Lasers 1999;30:260-5. Jampel HD, Friedman DS, Lubomski LH, Kempen JH, Quigley H, Congdon N, et al. Effect of technique on intraocular pressure after combined cataract and glaucoma surgery: An evidence-based review. Ophthalmology 2002;109:2215-24. Mittal S, Mittal A, Ramakrishnan R. Safety and efficacy of manual small-incision cataract surgery combined with trabeculectomy: Comparison with phacotrabeculectomy. Asian J Ophthalmol 2008;10:221-9. Venkatesh R, Sengupta S, Robin AL. Mitomycin C-augmented trabeculectomy combined with single-site manual small-incision cataract surgery through a tunnel flap technique. Asia Pac J Ophthalmol (Phila) 2012;1:142-6. Vijaya L, David RL. Safety and efficacy of single-site phacotrabeculectomy with mitomycin C using nylon and polyglactin suture for scleral tunnel closure. J Glaucoma 2015;24:e64-8. Longstaff S, Wormald RP, Mazover A, Hitchings RA. Glaucoma triple procedures: Efficacy of intraocular pressure control and visual outcome. Ophthalmic Surg 1990;21:786-93. Mamalis N, Lohner S, Rand AN, Crandall AS. Combined phacoemulsification, intraocular lens implantation, and trabeculectomy. J Cataract Refract Surg 1996;22:467-73. Bowman RJ, Hay A, Wood ML, Murdoch IE. Combined cataract and trabeculectomy surgery for advanced glaucoma in East Africa; visual and intra-ocular pressure outcomes. Eye (Lond) 2010;24:573-7.